In Mythic Europel some wizards serve the terrible power that ruled the world at the dawn of time, and plot to grant them mastery once more. Others would take everyone to a glorious new existence, careless of whether they want to go. Still more have nothing but the best of intentions, but risk anything to achieve their goals. If they are not stopped, their power will twist and consume the world and all who live in it. 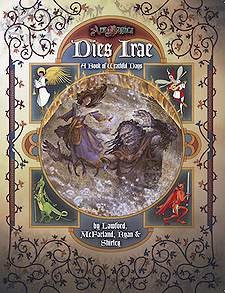 This book includes four great threats to th world of Ars Magica Fifth Edition, with stories centred around both attemptin to stop the disaster, and surviving the atermath if the characters fail. When the fate of the world is truly in their hands, will your character rise to the challenge... or let everything fall to ash?